The USA was the country of the famous expresses linking the Atlantic with Chicago and Chicago with the Pacific and it was the country of the pioneers who created this great network of private railroad companies. The Atchison, Topeka & Santa Fe Railway (ATSF) was the main competitor. His most important acquisitions were the later Missouri Pacific and various railroads in the East. His son George Jay Gould bought the Denver & Rio Grande and ruined it by building the Western Pacific. 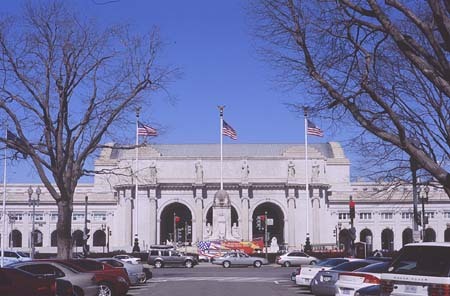 Missouri Pacific and Western Pacific were merged by the Union Pacific. George Mortimer Pullman established the Pullman's Palace Car Co in 1867. In 1899 he acquired the Wagner Palace Car Co. which ran the services on the New York Central. 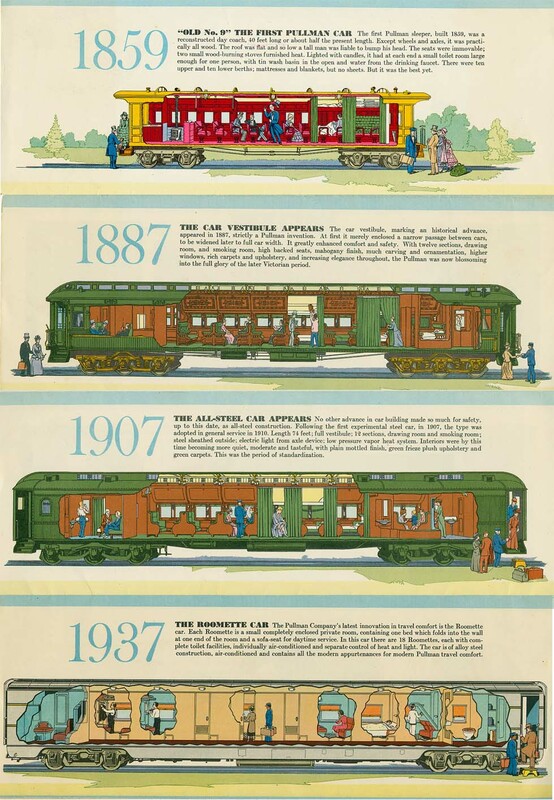 Pullman's successors owned nearly all sleeping cars in the U.S.A. until 1947 and withdrew from services in 1968. (Colors of Pullman cars initially brown, from 1901 green). Robert R. Young after WWII sold the Baltimore & Ohio and bought New York Central. Facing the end of the railway age he committed suicide in January 1958. Three months later the 20th Century ceased to be a de-Luxe. NYC and Pennsylvania merged in 1968 and were bankrupt in 1970. 1827: Baltimore & Ohio Railroad licensed, but the important links to Chicago were created by the later NYC and by PRR. 1869: First train services Omaha-Oakland by the newly opened UP/CP (later SP) Overland route. 1887: Overland Flyer, from 1896 Overland Limited Chicago - Oakland (ferry connection to San Francisco). 1892: California Limited Chicago - Los Angeles (by ATSF), 1911-14 additional Santa Fe de-Luxe. 1893: Exposition Flyer New York - Chicago (by NYC, only 1893). 1894: Sunset Limited New Orleans - Oakland (by SP). 1897: Lake Shore Limited New - York - Chicago (by NYC, Wagner sleepers, from 1901 Pullman). 1900: North Coast Limited St. Paul (from 1911 Chicago) - Seattle (by NP). 1902: Pennsylvania Special New York - Chicago (all-Pullman, by PRR). 1905: Oriental Limited Chicago - Seattle (by GN), from 1929 Empire Builder. 1936: Super Chief Chicago - Los Angeles (by ATSF), from 1937 the first all- Pullman de-Luxe Diesel streamliner. 1936: City of Los Angeles and City of San Francisco, from Chicago (by C&NW/UP/SP), the first true diesel streamliners. 1938: 20th Century Limited streamliners. 1938: El Capitan Chicago - Los Angeles (by ATSF). 1946: Pullman sleeping cars from East - to West Coast for the Transcon (short-lived), San Francisco Overland, Los Angeles Limited, California Zephyr, Chief and Sunset Limited. The idea of a Century - Super Chief did not materialize. 1947: Golden Rocket project for a streamliner Chicago - El Paso - Los Angeles by Rock Island and SP cancelled. 1947/48: North Coast Limited a streamliner. 1949: California Zephyr Chicago - Oakland (via D & RGW) with the first vista domes. 1955: City of Los Angeles via Milwaukee Road instead of C & NW. 1967: 20th Century Limited (since 1958 including coaches) suspended. 1968: Super Chief (temporarily with coaches) and El Capitan combined, Chief suspended. 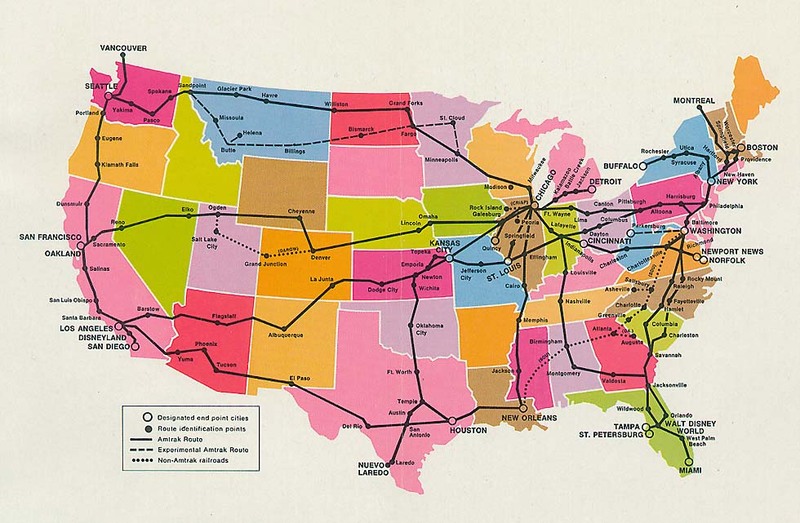 1971: Most of the few remaining U.S. passenger train services were taken over by government - supported Amtrak. 1971: Rio Grande Zephyr Denver - Salt Lake City (by D&RGW), connecting with Amtrak's San Francisco Zephyr Chicago - Denver - Cheyenne - Oakland. 1973: Super Chief renamed South West Limited, later South West Chief. 1978: Sleeper New York - Kansas City - Los Angeles on South West Chief abandoned. 1983: Amtrak Superliner cars on Empire Builder, then also California Zephyr, Southwest Chief, Texas Eagle, Coast Starlight, Sunset Limited, Capitol Limited. City of New Orleans, Auto Train. 1989: American European Express (AEE), a de-Luxe service by Alby Glatt, initially combined with the Broadway, in 1991 independently, then stopped. 1997: American Orient Express, a tourist special with the AEE cars, later the Grand Luxe Express. 1997: Sunset Limited Orlando - Jacksonville - New Orleans - Los Angeles, combined with Texas Eagle Chicago - San Antonio - Los Angeles - Capitol Limited and South West Chief temporarily combined Washington � Chicago � Los Angeles. 2008: Sunset Limited only New Orleans � Los Angeles, combined with Texas Eagle. The new railway age of high-speed intercity trains had started in Japan in 1964. The first attempt in the United States were the Metroliner electric multiple units from 1969, running New York - Washington DC. They were replaced by rather similar trains hauled by AEM7 electric locomotives, a derivative of the Swedish Rc4. Turbotrains, started in 1969, had no future. "Amtrak Cascades" Talgo trains with F59PHI diesel locomotives, introduced in 1999 between Eugene, Seattle and Vancouver, are comparatively slow. The first true high-speed services by Amtrak started with the Acela trains on the electrified Northeast Corridor line Washington - New York - Boston, with 6400 kW capable of running at 150 mph or 241 km/h. They were delivered by Alstom-Bombardier in 1999-2000, a derivative of the French TGV, but not articulated. Years ago the German ICE1 had toured the USA, locomotive-hauled of course, but Alstom was preferred. Initial technical problems had been solved and the Acela trains in sparkling silver with an elegant interior became an option for the future. The �City Sprinter� electric engines from Siemens are conceived for conventional trains. For San Francisco � Los Angeles � San Diego the HRSA high-speed project came on the agenda. Privatization of the Northeast Corridor for extending high-speed was proposed. In March 2011 however, the Railway Gazette Intl informed that in Florida the Republican Governor R. Scott �decided to reject any federal funding for the proposed 135km high speed line between Tampa and Orlando (�) which had been widely seen as a flagship for introducing high-speed rail in the USA.� In 2012 funding for the first section of the Los Angeles � San Francisco high-speed line was signed by Governor Jerry Brown. 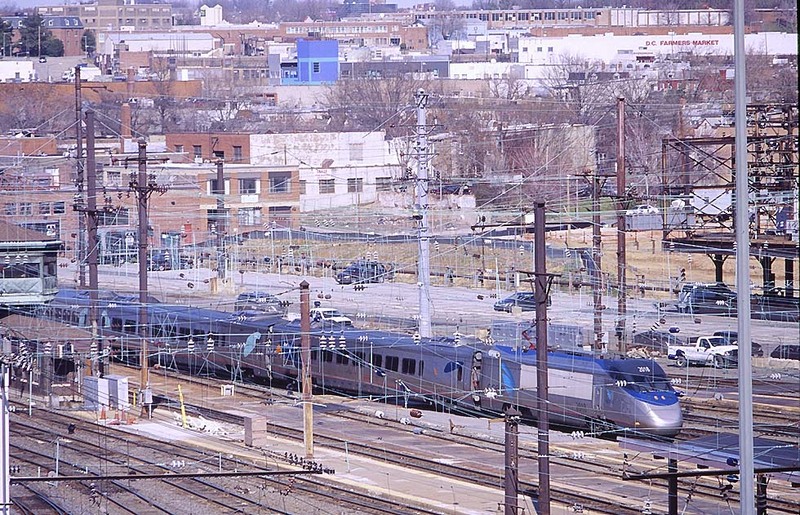 For the Northeast Corridor, Amtrak was reported in 2015 to get the next generation of high-speed trains from Alstom. America�s first �Bullet Train� for 350 km/h became targeted mainly by Jerry Brown, the long-term Governor of California. In 2015 he opened construction work for the CHSRA�s 1300km high-speed line Los Angeles � San Francisco, intended for completion in 1929, later to connect also San Diego in the south, opposed by environmentalism, oil industry and Republican politics, as Spiegel Online reported it in 2015. Acela consist: Electric engine unit, 1st class, bistro, 4 cars business class, electric engine unit (nos. 2001-2039).